Enjoy the beautiful scenic surroundings as you explore by Paddleboard Big Sabine Bay. 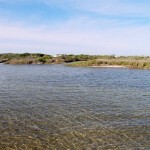 Big Sabine Bay is located just east of Portofino Island Resort on Pensacola Beach. The excursion will be led by a ACA certified instructor. Questions about the excursions or lessons? Call us at 850-723-7579 or email us here. Inner Voyage includes a lesson and guided breath-work/meditations on a paddleboard. Sign up and you’ll also receive a cool silk screened bag or t-shirt. No experience necessary. Question about the excursions or lessons? Call us at 850-723-7579 or email us here. We paddle year round. Sign up for a lesson or excursion during the off season at a discounted rate.